A recent feature in NONWOVENS INDUSTRY reveals a movement toward manufacturers achieving FDA, EPA approval to demonstrate safety and effectiveness in certain types of wipes. The article includes insights from Kleen Test Products. See the excerpts below. 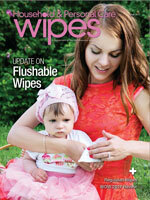 Read the full article, Focus On: Regulated Wipes. Kleen Test also produces a number of EPA surface disinfecting products for wipes that are used on hard surfaces. Typical active ingredients that are used in these products are Quaternary compounds, alcohol, bleach and hydrogen peroxide. “Some of these active ingredients require specialized filling facilities and equipment. Kleen Test Products has the infrastructure and equipment necessary to manufacture these products under both FDA and EPA guidelines,” Noel explains.